........Brickmaking c. 1850 ADThere are five steps needed to make bricks. The first step is called WINNING, or mining the clay. Because the steam shovel was not invented until 1879 early brickmakers had to dig for the clay on site with hand shovels. This was done in autumn. The early brickmaker chose his clay by it’s colour and texture and based on his experience. He sought clay that was located just under the topsoil to minimise the hard work of digging it with hand spades. The clay was exposed to the weather so that the freeze-thaw cycle of the winter could break the clay down and allow it to be worked by hand. The winter made the clay soft and removed unwanted oxides. The clay was removed from the soaking pit or pug mill by a temperer who delivered it to the moulding table. The third step is MOULDING. The assistant brick moulder was called the “clot” moulder and he would prepare a lump of clay and give it to the brick moulder. The brickmoulder was the key to the operation and he was the head of the team. He would stand at the moulding table for twelve to fourteen hours a day and with the help of his assistants could make 3500 to 5000 bricks in a day. He would take the clot of clay, roll it in sand and “dash” it into the sanded mould. The clay was pressed into the mould with the hands and the excess clay removed from the top of the mould with a strike, which was a flat stick that had been soaking in water. This excess clay was returned to the clot moulder to be reformed . Sand was used to prevent the clay from sticking to the mould. Single, double, four or six brick moulds were used. 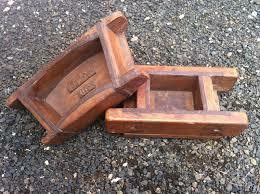 The single brick mould had an advantage in that a child could carry it to the drying area. Beech wood was the preferred material for the mould for it was claimed that the clay would not stick to it. The top of the mould was laminated with iron to prevent wear. The brick slid easily out of the mould because it was sanded and these bricks are referred to as “sand struck bricks“. The process was also referred to as slop moulding. The next person on the team was called an off-bearer. He would walk up to the moulding table, remove the filled mould and take it to a drying area on a pallet or barrow where it would be placed on a level bed of sand. He would then return the mould to the table and wet and sand it to receive the next brick. If fired bricks were on hand they were used to construct the outer walls of the kiln and the surface was daubed with mud to contain the heat. If no fired bricks were availible the kiln was constructed entirely of green or raw bricks which were stacked in such a way as to act as their own kiln. These kilns were called clamps or scove kilns. Wood and coal were used for fuel. Even after drying in air the green bricks contained 9-15% water. For this reason the fires were kept low for 24-48 hours to finish the drying process and during this time steam could be seen coming from the top of the kiln. This was called “water smoke”. Once the gases cleared this was the sign to increase the intensity of the fires. If it was done too soon the steam created in the bricks would cause them to explode. Intense fires were maintained in the fire holes around the clock for a week until temperatures of 1800 degrees F were reached. The knowledge and experience of the brickmaker dictated when the fireholes would be bricked over and the heat was allowed to slowly dissipate over another week. When the kiln was disassembled the sorting process began. If only raw bricks were used, the bricks from the outermost walls were kept to be burned again in the next kiln. Some bricks which were closest to the fire received a natural wood ash glaze from the sand that fell into the fires and became vaporised and deposited on the bricks. These bricks were used in the interior courses of the walls. Bricks that became severely over burned and cracked or warped were called clinkers and were occasionally used for garden walls or garden paths. The best bricks were chosen for use on the exterior walls of the building. Those that were only slightly under fired had a salmon colour and early bricklayers knew that the porosity of these bricks would help to insulate the structure and they were placed on the innermost courses of the wall. 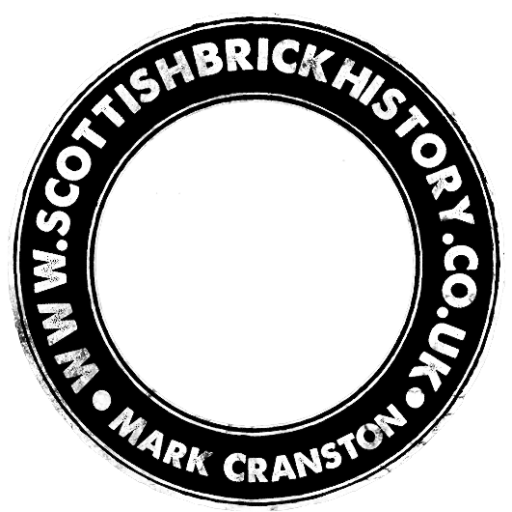 Below – 14/05/1902 – Falkirk Herald – Operations in Brickmaking. The general operations in brickmaking may be placed under three headings (says a writer in the May part of “Building World”). namely, (1)preparation of the earth ; (2) moulding ; (3) burning. Preparation of the earth : The methods of rendering the clay suitable for making of brick varies greatly, depending upon the nature of the clay and the class of brick required. In yards where bricks are hand-made, the clay is dug, and spread out during the cold season for weathering. When brickmaking begins, it is mixed with other mineral bodies, such as chalk, which acts as a flux, or sand and ashes prevent excessive shrinkage, just according to the physical property that is lacking (the clay being seldom found having the right constituents for making good-bricks, without any such addition), and thoroughly mixed and tempered in a pug-mill. For the best bricks, the clay is ground in a wash-mill, and strained through fine sieves to remove all lumps and stones. In some districts the stones are removed from the clay by hand, and the clay is tempered by spade labour. Moulding: A piece of tempered clay is thrown with force into a wood or iron mould, and pressed down so as to fill every part of the mould, the superfluous clay being struck off with a wooden straight edge. The raw bricks are placed on a drying floor until firm enough to be handled, when they are built into hacks to complete the drying. Where large machine plants are laid down for making bricks, the grinding, tempering, and moulding are often done in one continuous operation by one machine. The clay is dug, wheeled to the hopper of the machine, and tipped in; beneath the hopper are two or three sets of rollers, which grind the clay and pass it into the pug-mill, whence it is forced out in two continuous prisms, which are cut into lengths the size of bricks by wires fixed in a frame. Burning : There are two methods by which bricks are burned, namely, kiln-burning and clamp burning. The kiln in common use is a rough rectangular building, having holes in the side walls directly opposite one another. This chamber is filled with raw bricks, flues being formed with them connecting the fire-holes, and the bricks above, spaced so that the fire can get around them. The top is covered with old bricks or boards to keep in the heat ; the time required for burning is about a week. Clamp-burning : This method is confined to one class of brick, and that is the stock brick as it contains part of the fuel that eventually burns it, being really a live fire itself when the clamp is slight. The clamp is formed of three alternate rows of raw bricks and breeze, with live holes filled with breeze and faggots, and on this the bricks are built into parallel walls or necks three bricks thick, and the top is covered with a layer of breeze and two or three layers of bricks. When the fires are well alight, the live holes are stopped; the time required for burning varies from three to six weeks.